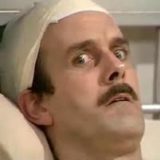 Fawlty Towers episodes were all jointly written by John Cleese and Connie Booth. It is a fictional hotel in the seaside town of Torquay. The plots centre on the tense, rude and put-upon owner Basil Fawlty, his bossy wife Sybil, the sensible chambermaid Polly and the hapless Spanish waiter Manuel. Basil’s attempts to run the hotel end in farce and total disaster in every episode. 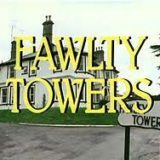 Fawlty Towers was ranked first on a list of the 100 Greatest British Television Programmes drawn up by the British Film Institute in 2000. 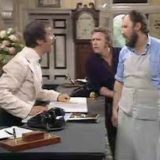 The Germans – Sybil is in hospital having an ingrowing toenail removed and that, of course, means that Basil is in charge of the hotel all on his own – so what could possibly go wrong! A moose head to be hung, a fire drill to be conducted, and German guests send the concussed Basil into a total manic breakdown. The Builders – Against his wife’s wishes, Basil hires a bunch of incompetent builders to do some renovation work in the hotel lobby. Basil and Sybil out for the afternoon, so Manuel and Polly are left in charge. Unfortunately, Polly is tired so she leaves the hapless Manuel to direct the builders. When Basil returns he finds the hotel renovations have been disastrously botched. Now, he must correct everything before Sybil has him strung up.